Need more information about booking Property 3851067 ? Davelyn is a private resort villa situated just outside of Montego Bay, Jamaica, complete with the services of a cook, maid, and caretaker to handle the chores while pampering you with inimitable Jamaican hospitality. Each bedroom at Davelyn Villa has luxury bedding, an en-suite bathroom, air conditioning and ceiling fan as well as television with cable for your comfort. You will enjoy relaxing on the comfortable furniture in the living room, while taking in a movie or listening to music from the entertainment center. Access the internet from our desktop computer or bring your own devices and use the WiFi throughout the villa. We have everything you need to enjoy your Jamaican vacation - all that's missing is you! We make it easy for you to stay with us. Our rates are based on the number of rooms you need and the number of nights you stay. For example, if your party only needs two rooms, we will charge only for those two rooms, and we will not book any other guests during your stay, so that you can enjoy Davelyn Villa in privacy. Check out our rates below and contact us for quotes for any longer stays. Your stay includes transportation to and from Sangster International Airport (MBJ). Most of our guests travel around Montego Bay in taxis. Short trips from the villa to downtown Montego Bay cost $5 per person. Day trips and excursions to attractions like Negril or Dunn's River Falls start at $40 USD RT per person. Please speak to our villa staff for assistance with organizing your taxi transportation. We want guests to feel at home at Davelyn Villa, and will interact as much or little as you require. One member of our staff is on site at all times to respond to any guest queries, as well as to provide cooking and housekeeping services during the appointed hours. When not supporting guests, she will be in a private room, leaving guests free to enjoy the villa. Smoking is permitted only in the outdoor areas of the home - front porch, back patio and pool deck. Visited this villa in June 2015 for a girls trip. The villa is nice and staff was awesome. Ms. Kesha was very sweet and she is an awesome cook! It was 6 of us and we occupied 3 of the 4 rooms. The house was very clean, big and open allowing the breeze through the entire house. The beds are comfortable. Each room has an air conditioner that is available but we didn't need it during the day as we were gone all day but early evenings, if there is a nice breeze, it goes through....it's wonderful! The price included airport transfers so, our group was picked up on time. The home also has WiFi and cable in each room. Ms. Kesha was very helpful with getting us taxi/transportation to pick us up when we wanted to go out or wanted to go to the beach. I've been to Jamaica several times but this was my first time staying in Montego and this villa was definitely worth it! Will definitely stay again! Response from the owner We are so glad that you enjoyed your stay with us at Davelyn Villa! We like to travel ourselves, and do our best to make sure that our guests have the kind of experience that we would enjoy. Our staff takes pride in making our guests comfortable, so they will be happy to hear that you enjoyed your stay. We look forward to seeing you again soon! My friends and I stayed at Davelyn Villa for 10 days, and it was the best 10 days ever. We enjoyed Davelyn sooo much. It was a great experience for us all. I don't think we'll ever stay at a resort in Jamaica again. The villa is exactly as pictured, and well kept. Cherrie, Keisha, Jr, and Marie all made us feel at home. They were all extremely accommodating and warm. We felt so comfortable there. We were like family by the time we left. We even shed a few tears when it was time to go home:( I'm so happy we chose Davelyn. Thank you Davelyn staff for making our Jamaica vacation a vacation to remember! We'll be back again soon! First off,Kesiha our cook/housekeeper and Junior were the best and took very good care of us. The pool was awesome, the deep end was so deep that we could jump in without worrying about hitting bottom. We had our very own mango tree which we picked from every day, delicious! The house was very spacious and nice. We would definitely return. We also was very close to the best jerk chicken place called Shotski's. Enjoyed my stay thoroughly at Davelyn Villa. The bed was comfortable and the rooms very roomy. Felt extremely comfortable and enjoyed the staff very much. They were extremely friendly and took great care of us! We enjoyed the pool and the surrounding scenery... beautiful. Would definitely stay there again!!! 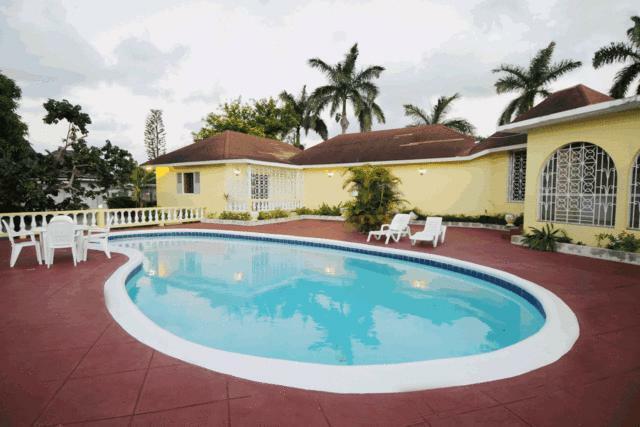 Davelyn Villa was a perfect place for a Jamaican vacation. The villa is located in Iron Shores not too far from the airport. Just down the hill is a shopping area with everything a traveler would need. The villa itself is wonderful. The bedrooms are well appointed and comfortable. The staff are more than friendly - they truly make you feel at home and comfortable. Keisha was a great cook. Junior was very attentive to whatever was needed. The pool was lovely. We even loved the guard dog! Each day we walked through the neighborhood. All of the villas are gorgeous and it was a very scenic walk. You can see the ocean from the street. I loved having the comforts of home in a large sprawling villa. The kitchen was huge and well equipped. The location was very quiet too. The villa backs onto a golf course - though we didn't see too many golfers while we were there. We enjoyed the screened in porch too for evening games of dominoes. The villa looks just like the pictures. It was a great value and a fabulous place to stay. I will definitely be going back again. We spent a lot of time at Doctor's Cave beach - the snorkeling there was amazing! We went to the casino down in the shopping plaza and the bartenders were especially entertaining - see Renville if you go there. He's quite the entertainer! Overall - I couldn't have asked for a better vacation. I had stayed at Sandals properties twice before and loved being right on the beach. But for the cost and the flexibility - the villa was perfect. It was a wonderful choice for a great family vacation. Do not let this villa past you by, this villa is deceiving from the internet. It is very roomy, and big inside, the rooms are very well maintained and kept up daily. There are Flat sceens tv's in each room. Don't forget (affordable)by night or weekly. They provide transfer from the airport,and cell phone to use why you are in Mobay. (wow)plus plus::: awsome house all the way around. I will save some goodies for you to see yourself. Response from the owner Jan - Thanks for the great feedback! We really work hard to make sure our guests feel at home at Davelyn Villa, and are glad to hear when we've been successful. We hope to see you again at Davelyn soon! Davelyn was a perfect place for our vacation. Nestled in the hills, away from the hustle and bustle of the giant resorts, it was what we were looking for: a little bit of peace and quiet. The Villa itself is nicely appointed with all the amenities you would expect to find. It was a luxury to have a pool all to ourselves anytime we wanted. Getting around was rather easy, there are always locals zipping by in their cars who will stop and ask if you need a "taxi". We actually rented a car about half way through the week as we wanted to drive to Negril and Ochie and the cost of a rental was comparable to a taxi for the days we would have used them. Davelyn is located in a subdivision where everyone has a guard dog. Not to worry, the dogs are behind gates or restrained but the only downside was if one started barking, they all started barking. This also unfortunately had a tendency to occur rather early in the morning, and since Davelyn Villa backs onto a golf course, happened whenever a player was near. Not a fault on the part of the Villa by any means, but we were basically woken up every morning at 7 by barking dogs, despite the windows being closed and the a/C being on. Having said that, this only gave me an excuse to nap in the afternoon and not feel lazy! The staff were wonderful, accommodating and helpful as to local things to see and do. I would highly recommend Davelyn Villa for those looking for a place to stay in Montego Bay. Response from the owner Hi Britt, We're glad that you got to catch up with yourself and relax a bit at Davelyn Villa. Of course we wish we could silence the barking dogs, but we're pleased that otherwise you had a comfortable and luxurious experience with us, complete with naps and local excursions! Response from the owner Thanks for the feedback, Jen. We really appreciate the opportunity to improve the quality of the experience at Davelyn Villa. We only wish that we would have known the full extent of the problem during your stay so that we could have fixed the problem for you and your family. As Jen noted, the staff are very responsive and take great pride in providing excellent service to all guests who stay at Davelyn Villa. In addition to the housekeeper and cook who are on site during the day, there is a full-time caretaker available to assist guests at all times. We have all of the air conditioning units in the house serviced on a routine basis to keep them in perfect working order. When notified of an issue with the air conditioning unit in one bedroom during Jen's stay, the staff called in a service technician to reprogram the relevant remote control. However, our staff was not aware that guests in other bedrooms were also having problems with their units. To address the issue moving forward, we have had a service technician come out to assess all of the air conditioning units in the villa and fix any issues found. Also, we (the owners) will be personally visiting Davelyn Villa in the next few days to confirm that all of the air conditioning units are in good working condition. Finally, our staff will routinely ask guests if the climate is comfortable in the house, so they can identify and address issues as soon as they arise. In this way, we plan to ensure that all guests of Davelyn Villa continue to enjoy their stay with us. As always, we encourage all of our guests, past and present, to let us know how we can improve their experience. The staff was very friendly, helpful, courteous and attentive. Meals were tastefully prepared. Staff pleasantly accomodated request to iron clothing and run errands. The home is meticulously decorated, rooms are spacious, hot water was always available, bathrooms were cleaned on a daily basis, towels were always available for both the bathroom and the pool. The property is located in a very quiet neighbourhood. Close to restaurnats, airport, supermarket, banks, golf course and the beach.The swimming pool was amazing. I can truly say that this experience lived up to my expectaton and I wil be returning later this year. You can get in touch with Kristin (the owner) through the contact form on this page. Send Kristin (the owner) an email through the contact form on this page. Alternatively, if there’s a phone number on this page, you can call them. How do I contact Kristin (the owner)? If you’ve already booked, go to Manage your booking to view Kristin the owner's contact details or send them a message. Or send Kristin (the owner) an inquiry through the Contact the owner/manager form if you’d like a quote or more info first. When you pay online through the Ready to book? form, a booking request is sent to Kristin (the owner). You’ll find out within 24 hours whether they’ve accepted - no money will leave your account before then. You can also request a quote from Kristin (the owner) through the contact form. The owner will email you the total cost for your dates and a link to book and pay online. Use the Ready to book? form to pay provisionally online. You can pay by credit/debit card or PayPal. Kristin (the owner) will have 24 hours to accept the booking and no money will leave your account before then. Why can't I call Kristin (the owner) before booking? You’ll need to contact Kristin (the owner) to do this. Send them a message in Manage your booking or through the contact form on this page. You can request to change the dates or number of people on your booking via the Manage your booking page. To change your dates use the Edit booking button. If you need to change the number of guests staying then send Kristin (the owner) a message. If Kristin (the owner) agrees, they’ll send you a revised quote outlining the changes. You can review and accept/decline this from the Manage your booking page. You’ll have 48 hours to take action before the revised quote expires.